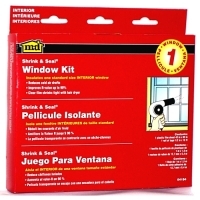 Shrink & Seal Indoor Window Kit is installed around entire window to eliminate cold air drafts and frost build-up. Crystal clear film that is easy to install with a hair dryer that shrinks tight and wrinkle free. Creates dead air space to increase insulating R-Value up to 90%.